I would like to start this post by saying, I would have never been able to even attempt a triathlon a year ago. I was over-weight, out of shape and just not even in that frame of mind. But- what a difference a year has made. I have dropped about 30 lbs and am officially a triathlete! Not only a triathlete but looking forward to the start of next season and racing again! Now- back to race #1! haha :) I arrived early on race day to pick up my packet and set up my transition area. I actually was the first one there- got a great spot. As race time approached I was more and more nervous- but I have the best friends and family in the world. My whole family was there to support me and my friends Dutch and Robin made shirts for everyone! TEAM JULIA It was great to have such a big cheering section. They are the best a girl could ask for. My trainer (who is also my massage therapist) took the day off from clients to be there for me! I had the BEST cheering section at the tri! I walked over to the race briefing. A run down of the swim course, swim out and around the 2 kayaks, and avoid swimming into rocks at the end! The bike course we were told was wet and slippery- great I was already nervous about that part. Not too much insight into the run. There were 3 waves- elites/teams and men and women. 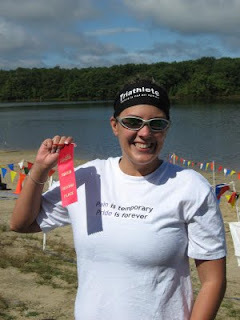 I had signed up to compete as an Athena 150lbs+ I wore my Under Armour sports bra and TYR tri shorts into the water. Each wave started 3 minutes apart- a standing water start. I moved myself to the front but off to the left side. I hoped that would keep me from getting kicked/swimmed over. I started out the swim a little harder than I planned- and realized as I was trying to spot the kayaks. Even with slowing down a little I was out of the water in 7:55 for the 1/4mi swim. The 6th woman out of the water! Just where I wanted to be. T1 consisted of putting on my socks, running shoes, jersey, racebelt, helmet, sunglasses, my bondiband headband , and grabbing my bike.I did that all in 2:27. Not a bad transition time. The bike started out as a trail then hit pavement (straight up hill) then hit hard single track trails! I had mountain biked quite a few times, but when you are on difficult terrain with other people around you, it was a lot harder. I was on and off the bike a lot. I even fell in the woods once. But I played it smart- if I thought I could get hurt doing something I got off the bike and walked/ran. I finished the 5.5mi mountain bike in 44:27. Right around where I wanted to be. I brought the bike in for T2. All I needed to do was take on some fuel- my choice fuel is Cliff Shot Blocks- and took on some water. Transition2 was only 1:08. Fast turnaround without changing shoes. I was covered in mud and had to wipe some of it off. I was pretty tired going into the run. I had that lead leg feeling. I had practiced quite a few bricks of bike/run but that feeling slowed me down as I hit the trails. I had to pull my legs through the run. I ran slow- a lot slower than I wanted to be. the 2.5mi trail run took 31:10. The fact that my run was slower than I wanted and the fact that I was exhausted didn't stop me from being so excited when I hit the finish line. Through the whole run I kept thinking just finish and you will be a triathlete. My cheering section errupted as I came to cross the finish. I wanted to cry but I was so excicted! I had done it! In 1 hour and 27 minutes I had finished my first triathlon! What a feeling of accomplishment. As I stood talking to everyone the awards ceremony started. I was just happy to be a triathlete and be with my family/friends. I didn't think I had done well enough to get any award. Dutch told me to put on my shoes and shirt. We walked over and I couldn't believe it- I got 2nd in my division! 2nd?! Honestly- I didn't believe it until I saw the results online. I then checked how I would have performed in my age group.I would have come in 1st in my age group by 3 minutes! I can't believe it. Not only did I finish my first triathlon I did well. I really can't wait for next season. I plan on starting the season with a sprint or 2 or more and working my way up to an olympic distance. It is so fun why not right?! Now onto the next challenge!